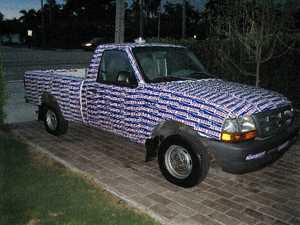 A Florida truck with 700 bumper stickers on it is stolen. Five days later it is located. The interesting thing is- All the stickers were removed. Would a thief go through all that work just to abandon the vehicle, or could this be South Florida's version of dirty politics? See the bumper stickers all promoted a mayoral candidate for the City of Hollywood. Of course Hollywood Mayor Mara Giulianti denies involvement in the theft. Don't you just love the sunshine state? In Hollywood, it's a case that Sherlock Holmes and the entire CSI crew might have a hard time solving. Was it a serious crime or political stunt? On Sept. 10, police responded to a report that a 1998 white Ford Ranger pickup was stolen from the home of Samuel Sites Jr. The truck should be easy to find, Sites told officers. It was covered with more than 700 red-and-blue ''Peter Bober for Mayor'' bumper stickers. And if that didn't make the truck stand out, there was a yellow flashing light on the roof, Sites added. Bober, a Hollywood city commissioner, is running against Mayor Mara Giulianti in January. Sites told detectives he and his friend, Richard Vest, were strong supporters of the challenger. Hollywood police found no broken glass or signs of forced entry at the site of the theft. Sites told officers he noticed the truck missing Sept. 7, according to the police report. It is not known why he waited three days to report the truck stolen. Five days later, officers found the white pickup in an alley off Johnson Street near U.S. 1 -- about a mile from Sites' home. The truck, worth about $8,000, appeared to be in fair condition. Nothing was missing -- except the 700 bumper stickers that covered the exterior. Finding the vehicle undamaged -- and some might say in better shape -- elicited more questions than answers. Even more inexplicable than someone allegedly stealing a vehicle that's so noticeable: How in the world did they get all those bumper stickers off? Hollywood residents are used to being assaulted with negative campaign ads and more political mailings than the Postal Service can keep up with. It only has one bumper sticker and a campaign poster on it, Giulianti said. She denies any involvement in the Bobermobile heist.